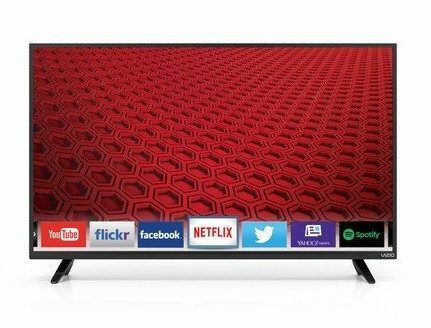 VIZIO 40-Inch 1080p Smart LED TV $299.99 (Was $380)! You are here: Home / Great Deals / Amazon Deals / VIZIO 40-Inch 1080p Smart LED TV $299.99 (Was $380)! The all-new 2015 E-Series 40″. Full-Array LED Smart TV has arrived. Featuring a new, modern design, brilliant picture quality, and faster, easier-to-use smart TV experience, the all-new E-Series brings you premium HD entertainment at an incredible value. Built-in high-speed Wi-Fi gets you connected in a snap, and with the hottest apps to choose from like Netflix, Amazon Instant Video, iHeartRadio, Hulu Plus, Spotify, YouTube and more. Enjoying what you want, when you want it is easier than ever before. Plus, you get brilliant picture quality using the latest advanced technologies!